Despite our still high temps, fall is here. This means it’s almost time for one of the Valley’s favorite food traditions: TEXAZ Grill‘s salute to The Texas State Fair. Served throughout the 2016 State Fair of Texas (September 30 – October 23), TEXAZ Grill’s TEXAZ State Fare Menu features Lone Star State favorites such as “Fletcher’s Original State Fair Corny Dog” and the iconic Frito Pie. Plus, wash it all down with TEXAZ Grill’s signature Cotton Candy Lemonade cocktail. Said to be invented in the 1930’s by Daisy Dean Doolin, mother of the founder of the Frito-Lay Company, this dish is a Texas original. 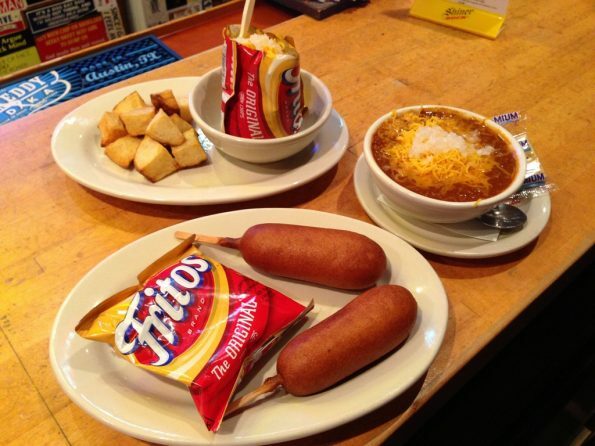 TEXAZ Grill’s version features homemade chili presented in a small bag of Fritos corn chips, topped with onions, cheese and served with a plastic spoon-now that’s authentic! Everyone’s favorite spun sugar in liquid form! The cocktail is made with cotton candy vodka, lemonade, Blue Curacao and garnished with a lemon slice.